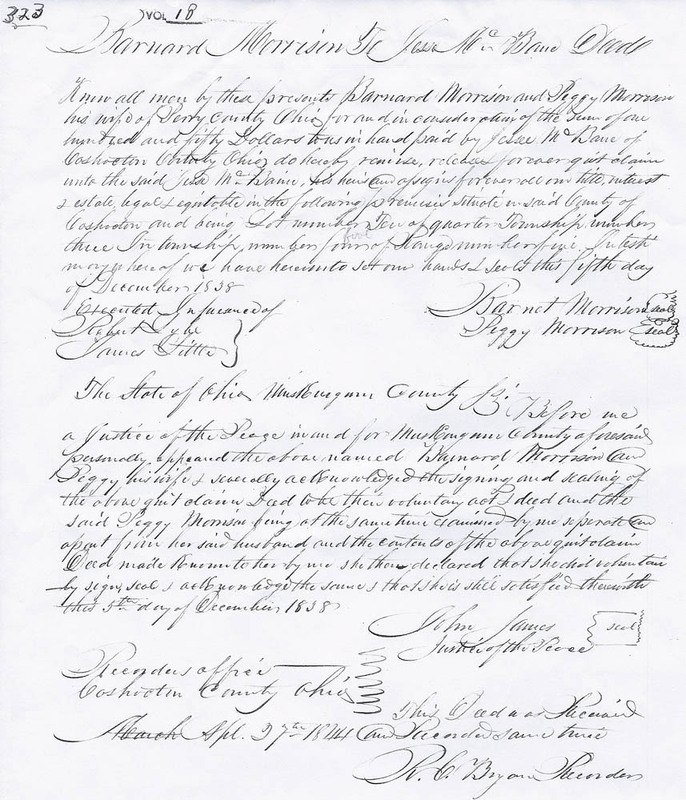 Know all men by these presents Barnard Morrison and Peggy Morrison his wife of Perry County Ohio for and in consideration of the sum of one hundred and fifty Dollars to us in hand paid by Jesse McBane of Coshocton County Ohio do hereby [revise ? ], release & forever quit claim unto the said Jesse McBane, his heirs and assigns forever all our title, interest & estate, legal & equitable in the following premises situate in said County of Coshocton and being Lot number Ten of quarter Township number three In township number four of Range number five. In testimony hereof we have here unto set our hands & seals this fifth day of December 1838.